A loyalty card scheme launched in Hailsham in March 2016 to give customers a greater incentive to use town centre shops continues to expand its membership from local businesses and is now offering a free trial of the existing 2018 Hailsham Card until 31st December 2018. The Hailsham Card scheme, which is funded by the Hailsham Forward town team and fully supported by Hailsham Town Council and the local Chamber of Commerce, offers exclusive discounts and offers to cardholders on independent retailers throughout the town centre. Free trials of the 2018 card are available from selected traders at Hailsham Street Market (Saturdays in Vicarage Field) for those who purchase products from their stalls. Participating traders include Moreton Sweets (The Sweet Man). Membership of the 2019 Hailsham Card (available soon) costs just £10 and cardholders can use the card to receive unlimited local discounts in all the local businesses that are part of the scheme (including any online businesses) together with any other towns across Sussex that are signed up to the scheme, including Eastbourne, Hastings and Bexhill. 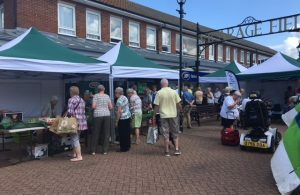 Hailsham Forward, which provided £1,000 for start-up costs and promotion of the scheme, is encouraging more local retailers to participate in and create revenue from the scheme.